Easy to install. Unscrew nozzle from sray body then screw on 6" extender then sdew nozzle back on. You can screw them together to make longer lengths. 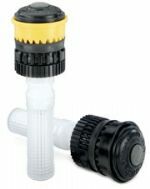 Rainbird 1800 15' SST (side strip) MPR nozzle for pop-up spray heads.Nozzle patter shoots forward 2 foot x 15 foot long. Rainbird 1800 5' Half Spray MPR Nozzle for Pop-Up Spray Heads. Nozzle pattern fine mist shoots 2 - 5 feet foward 180 degrees depending how tall your sprinkler is. Rainbird 1800 5' full Spray MPR Nozzle for Pop-Up Spray Heads. Nozzle pattern fine mist shoots 2 - 5 feet in a circle 360 degrees depending how tall your sprinkler is. Rainbird 1800 5' quarter Spray MPR Nozzle for Pop-Up Spray Heads. Nozzle pattern fine mist shoots 2 - 5 feet in a quarter 90 degrees depending how tall your sprinkler is. Rainbird 1800 8' Quarter spray MPR nozzle for pop-up spray heads. Nozzle patter 90 degrees forward. 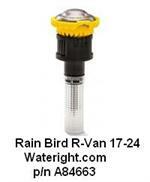 Rain Bird R-Van1724 Rotary mist head nozzle shoots 17 - 24 feet uses 1.77 - 2.8 gallons per minute of water. Can be adjusted down using set screw on top. I was able to lower it to 10 feet.